A world-famous eighteenth-century British figure, Lancelot “Capability” Brown (1716-1783) is today considered the father of landscape architecture. Moving Heaven and Earth reveals the driven polymath behind the famous nickname, exploring both Brown’s artistic legacy and his pioneering work with water in the landscape. The book evaluates the rise of the English landscape garden in the context of his designs. It also provides a comprehensive guide for travelers, with an overview of the 250 sites throughout England and Wales attributed to or connected with Brown. Over 350 magnificent color photographs pin-point Brown’s enduring views and surprisingly vibrant planting palette, showcasing his enduring significance. This beautifully illustrated book makes a fitting tribute to an important historical figure. "Anyone interested in English landscape design will love this book on the life and work of landscape architect Lancelot ("Capability") Brown (1716–83). Lavishly illustrated with Shields's own photographs, the book follows Brown’s career throughout England, beginning in his birthplace in Northumberland and continuing to his work as an engineer and architect—as a sculptor of land and creator of waterways; a planter of trees, shrubbery, and ha-has; and a designer of fountains and inventor of pumps. Stunning photographs of his work at some of the most famous gardens...are accompanied by sketches, paintings, site plans, diagrams, engravings, planting layouts, and letters from illustrious patrons. Beautifully organized and including an excellent bibliography, this book will be invaluable to scholars and connoisseurs of landscape design and 18th-century studies in general, and it will delight Anglophiles. Essential." 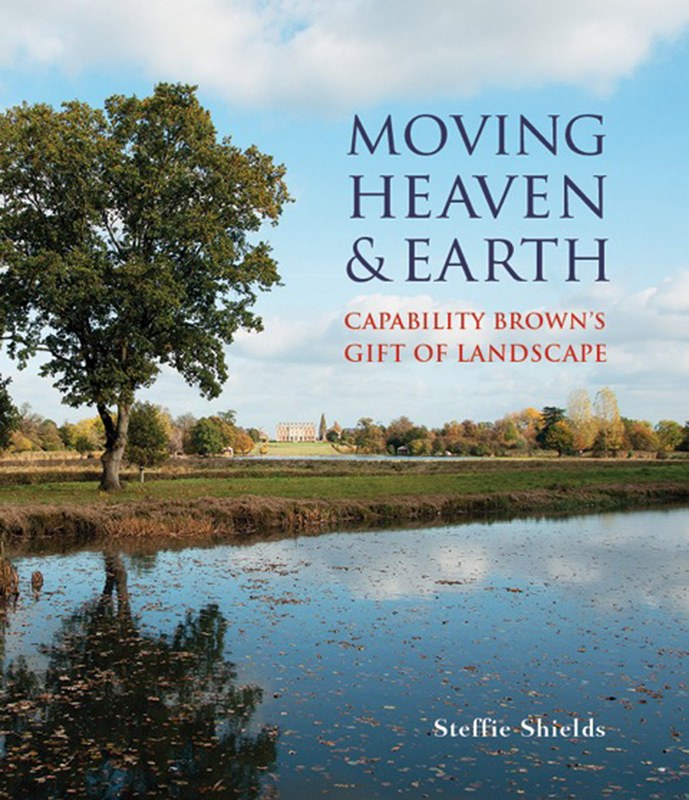 "Shields is [a] landscape historian who has made a special study of Brown over a number of years. Shields believes that Brown cut his teeth as a water engineer at the beginning of his career, in his native Northumberland, where he may have been first employed as a drainage specialist, not a landscape gardener. Her contention is that it was Brown’s technical management of water, including his ability to induce flow through a series of lakes, which set him apart from his contemporaries." "There can be no better year to buy a book on this great man, and Shields's book has an engaging personal voice that makes it more than a description of his life and works, it is about experiencing him through Shields's enthusiasm." "Moving Heaven and Earth sees the gardening writer drawing on many years of research to provide a thorough overview of Brown’s life and work. published to coincide with this year’s Brown tercentenary celebrations, the book is the result of a twenty-five-year fascination that has seen Shields travel the country, exploring hundreds of Brown’s landscapes on foot. Developing an interest in photography in tandem with her appreciation for Brown’s innovations, Shields includes a wealth of her own pictures in the book. Shields has provided us with a most useful guide with which to encounter and appreciate the beauty of those landscapes where they remain for us to enjoy them today."